The story of cattle disease in Connecticut in 1797 has an underlying religio-political history that symbolizes the changing relationship between the church and science. The popular perspective on animal diseases was that animals developed and suffered from diseases in much the same way as people. They experienced catarrh brought on by weather, consumption induced by miasma and humidity, apoplexy and madness due to exposure to too much sun, and fatigue brought on by cold blood and prolonged exposure to the elements. Long before veterinary medicine was a well defined science, physicians trained in people’s medicine also provided their services to livestock raisers and farriers. This skill of entrusting the practice of livestock care to physicians continued well into the Civil War years when physicians were put in charge of tending the cattle needed by troops for food and the horses needed by military leaders for transportation. In 1800, only a select few livestock diseases were well understood and appeared in the books published on livestock and farriers. Along with the increase in size of the farm came increased demands for crops, increased exposure to diseases, and increased human-animal contact. This meant that as the farm itself grew, disease possibilities also grew. With time, the need for larger grazing areas led to significant modifications in defining the use of living space. As larger and larger spaces were needed to fulfill the new stewardship needs, this had a tremendous impact on local ecology and air and water quality, adding a new cause for diseases within these fairly progressive communities. In due time, the once pristine environmental settings were completely transformed into unusable places, with some section completely destroyed due to garbage and waste. In larget hamlet and small village settings, these places that became dumping grounds were situated in the outskirts of downtown, on land where future farms could be raised. As the town or city grew, so too did its industries, and for the first time, significant amounts of industrial wastes produced by tanniers and local slaughterhouses were added to the contagion and putresecence considered to be responsible for diseases. In terms of upper New York State history, this meant that some of the least healthiest places had man-made causes for diseases located adjacent to these numerous natural causes along with butcher remains and other domesticated animal parts, rotting crop waste, and decaying earth closet remains. Throughout this period of growth, taking place all along the Hudson Valley from 1785 to 1815, the differences between animal health and people health induced by these environments seemed to be of little concern to farmworkers. Everyone feared the same consequences these places had on people and animal health, be these due to endemic detritus related causes or the more deadly epidemic disease causes. One of the major problems with trying to understand the concept of animal disease around 1800 pertains to understanding how they are diagnosed, named, and as a result treated. During the early 1800s, diseases were usually identified, classified and named based upon their symptoms. Some of the more popular examples of these names that still exist today and are often used when include such symptoms as ascites, edema and fever. In the very late 1700s and early 1800s, these symptom-based names served as statements about the state of the local environment and its tendency toward healthy and unhealthy living arrangements. The constant fever, a problem ongoing throughout the year, was distinctly different from the intermittent constant fever, a disease more seasonal in nature and often related to the weather, winds and putrescence generated by local swamps . Animal fevers were not as easy to differentiate from human diseases during this time. The consumption considered so fatal to man, was very different in cattle, but still evident and usually linked to the same causes as human consumption and often considered the source for human consumption. The problems livestock experienced when labelled as catarrh and cough were not as frequently accompanied by worser conditions such as wheezing and asthma as they were in humans, but still they had their worse states. Some of these worst of states were often called consumption, an end stage resulting from a less fatal unhealthy medical condition. Also, unlike humans, farm animals tended to experience more problems related to decaying skin, flesh and organs. So it was not unusual for a skin condition to be considered the predecessor to the ever fatal fever with consumption, or hypothermia accompanied by lunacy. The spells of fatigue, apoplexy, emotional anguish, and loss of control experienced by animals were considered to have the same causes noted for humans. Be it a case of rabies in people or in lovestock, the cause, effect and treatment were the same. The resemblances of the pustulent skin of cattle in relation to the small pox of people was proven to many to be true due to the nature of the cow or kine pox vaccine to assist people in avoiding the much more deadly, much worser form known as small pox. However, medical geography also played an important role in defining the causes for disease and even giving many of those diseases that could not otherwise be described a useful name. It was not uncommon for a disease to be named by the nature of its topography or climatic nature. The medical geography names assigned to endemic and epidemic disease, and enzootic and epizootic diseases that fit this requirement include lake fever, mountain fever, river sickness, farmer’s apoplexy, and field rash. With certain livestock diseases however, Biblical history and tales surpassed the importance of any new scientific views of diseases being developed. This was especially true for murrain, one of the seven epidemics laid upon the Egyptians during Moses’ time. 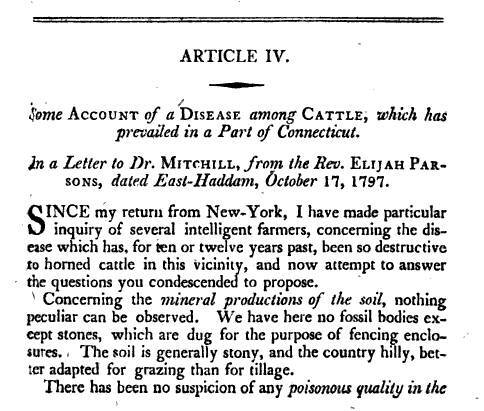 This is what led Reverend Elijah Parsons to write an article on the epidemic striking cattle in his home town area of Connecticut in 1797. In Reverend Parson’s eyes, this was one of several signs of the plagues taught to us by the Bible. This was the plague known as murrain. 1797 is a peak year when it came to a belief in the plagues according to the Bible. Since 1793, yellow fever was arriving almost yearly at various ports across the United States. The tendency was for it to strike a given port city quite severely late in the year around September or October for harbors located north of the Washington, D.C. area. The further north the town of city was, the later the arrival for this epidemic. This recurring pattern meant something to those devoted more to the Old and New Testament than to the latest books on the new philosophy and the potential causes for disease to be published. Many interpreted these 1793 to 1796 epidemics to be signs of God’s disappointment. This disappointment was due to the inequality that was already becoming apparent in a country inhabited by what the constitution labelled “equal” people. These first epidemic years were of little consequence in the development of this philosophy, until a social movement began devoted to the concept of trinity. These promoters of this trinity faith were of all religious groups, all ages, and members of nearly each and every social group that formed this society. The way in which the epidemic behaved resembled the actions taken by Jacob as he blessed every entranceway into a Jewish home with lamb’s blood. In every community, some houses had each and every family member fall victim to the plague arriving in the city, whereas neighboring houses remained untouched as if blessed by a Higher Power and saved from such a demise. With the return of deaths in some cities beginning about three years later, in 1797, came the confirmation needed to prove that this disease was God’s own creation. The three year periodicity that some religious leaders felt existed proved such claims, and even though no such name was ever officially published for this epidemic that arose in the United States from the late 1790s to about 1820, this three year or triennial epidemic was very symbolic of what settlers came to know as a trinity sign. 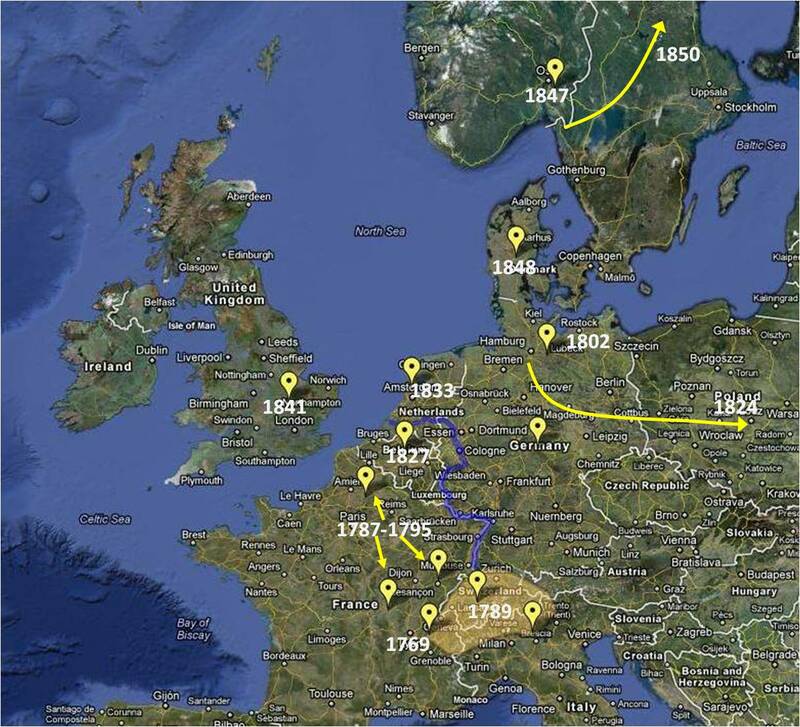 The cause for these trinity epidemics was yellow fever. 1793 was also not the first year that this disease came to the New World, but it was the first year it came with such viciousness and the ability to infect large numbers of households and community settings. For this reason, the yellow fever had many behaviors that were quickly interpreted as signs of God’s plagues, documented to us by the Old Testament and now playing out its return but in a new form. In a very short time the answer to this question would be “yes.” The development of the cattle disease murrain was the further evidence needed to prove that that God was once again punishing certain people, families and social settings. In the Old Testament, Murrain was fatal to cattle. For this reason, many of the early cattle diseases were referred to as murrain. In early United States history, three such Murrains can be identified in the early writings. These are the murrain of this essay, the murrain of Tennessee, New York and Ohio, and the murrain brought in by long horn cattle migrating northward out of Mexico and Texas. The geography of these three murrains, as well as their published histories and medical articles, tell us the causes for these three epizootic diseases. Each has its own unique cause. On occasion, within the different colonial settings, diseases came to be and caused a number of livestock animals to die. Such diseases were being experienced for the first time in New York and Connecticut history during the later years of the colonial era and the earliest years of United States history. Some of these diseases influencing the local livestock were already well documented in European history. Others appeared as though they were new additions to the local environment. In spite of the differences in symptoms between certain European livestock diseases and United States diseases, ancient names came to be assigned to these new diseases. This meant that for the first generation or two of United States pre-veterinarian livestock history, some diseases were going to receive identical names in spite of their minor differences. Murrain in cattle developed this sort of history, and as a result the murrain of New York and Connecticut came to be considered identical to the distinct murrains of Ohio and Tennessee. Religion became the deciding factor as to whether these diseases were in fact simply in need of scientific re-evaluation, or due to the true “acts of God” as many religious leaders claimed them to be. The livestock disease of Connecticut and New York experienced this history between 1795 and 1800. Whereas medicine itself was undergoing a period of significant scientific discovery, animal medicine remained an occupation and topic of study greatly influenced by religion. The author of the article describing such a disease in Connecticut was a religious leader, not a medical doctor. The field of animal husbandry was one of the last topics of study which allowed religious doctors to mingle with the increasingly scientifically minded medical doctors. Both shared some of their basic beliefs in the “acts of God,” but it was only the religious leaders who placed more weights upon “acts of God” than the possible events of natural science and philosophy that medicine had so heavily relied upon. Religion played an important role in how diseases were interpreted during the first decade or two of United States history. In an early 19th century Coroner’s guide for the city of Kingston, New York, Act of Gods is defined as one of the acceptible causes for death that can be entered on the legal documents. Due to a schism formed between medicine and religion during this time, every illness had at least two interpretations–that of the medical doctor and that of the other doctor–the religious leader who earned his doctoral degree at any of the many standard local or foreign higher education facilities then established. This label “doctor” actually had a much longer history being affiliated with the chruich and doctoring the body, mind, and soul long before it came into possession of the physical healers within each and every community. By the time the United States was established, and the roles and nomenclature assigned to each of these healers made more clear, with the help of state governors and state laws being passed, the meaning of this term was drastically changed. If an individual was a medical doctor, he/she had one set of rules to abide by. If the individual was a doctor of religion, he was still often referred to as “Doctor” for many of the legal documents and writings bearing his/her name (female “Doctors” were actually essentially non-existent by the way at this time), but socially could bear any of several titles. Titles such as Doctor, Deacon, Reverend or Pastor were used by those respecting of his or her classical religious upbringing and training. The medical doctor however still had to much to prove about his/her belief system and whether or not there was an equally “Higher” value that could be attached to his/her medicines, skills and ways of interpreting health and disease. This conflict between religion and medicine only got worse as the years passed in early American history. Suspended animation, the ability to revive a body seemingly dead, was one of the major discoveries getting in the way of the decision making process by an individual trying to define himself/herself as theophilic and mostly religiously bound in nature and psychology, or pragmatic and philosophically bound to the world as a physical being. Some religious leaders in the early United States were very much taunted by the physical findings of the real world, allowing them at times to become very anti-science and anti-evolution in terms of their philosophy about God and nature. Disease brought many of these philosophical worshippers back to the real world at times. Disease in theory was a perceived symbolic threat to mankind’s existence, but in the natural world, when disease came to the back steps of your home or infected your neighbor’s cattle and grains, and perhaps ultimately your own, a new interpretation of these very local curses from above had to be investigated, and at times speculated upon and promoted as signs of sin and lack of moral control. The Connecticut writer Elijah Parson is going through this exact same turmoil in his life and personal philosophy during the late 1790s, when the signs of the fifth plague of Moses crossed the oceans and found their way into his home town setting. As a Deacon or Pastor in 1797, he witnessed an unusual epidemic begin to strike cattle in and around parts of Connecticut. This was just a short ride from famous printer and writer Noah Webster’s palce in New Haven, with the New York Medical Respository as the first medical and science journal published for the region being printed right next door in New York city. To Deacon Parsons, this plague striking the cattle was interpreted as an new example of the 5th plague as told by Moses. Referred to as murrain, it was busy infecting cattle across western Europe during the years prior to this period in American history. Now, for the first time, it was an American disease as well. The most important social question it gave rise to for the time was ‘is this an epidemic serving as an example of God’s disgrace for how much we have overpopulated and overdeveloped the new country? or is it the simple result of an endemic status of the lands we have inhabited and changed over the years? The major question for the time, excluding whether or not the disease was in fact God’s Curse upon some of the people, was what disease was this new cattle disease. Deacon Parsons considered it to be a new and isolated series of cases developing in the young state of New York, due mostly to the rapid growth of the populations in this region since the closure of the Revolutionary War. Parsons wasn’t the only person to have this perspective on this disease amongst livestock famrs. Due to rapid growth, living areas became more settled in appearances, accompanied by waste and decay of human waste, garbage, industrial waste, carcasses and carcass pices from local tanneries and slaughterhouse, everything needed for either God to become angry and wish to take some revenge, or for the development of miasma and others forms of disease causing substances adjacent to heavily populated areas. Population growth may have been in its infancy in terms of long term United States history, but it took only these few years to make the youngest, most settled portions of the States to become homes to human and animal flesh, and the related filth and disease. The article reviewed for this page endes with a note on Germany. 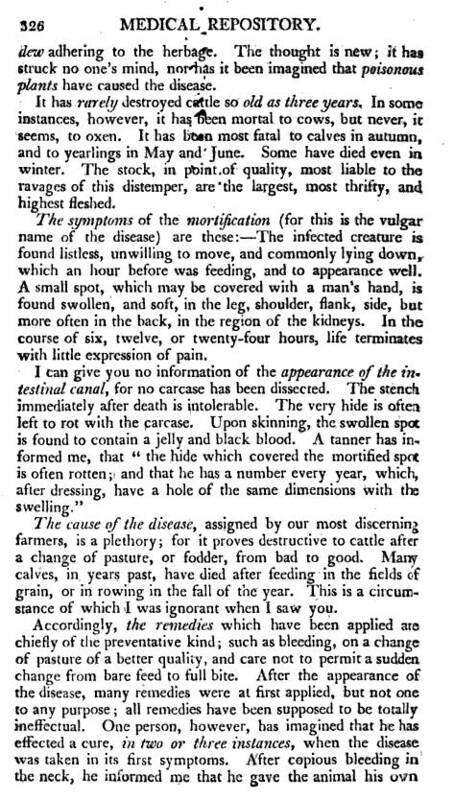 The author requests that if the editor of this medical journal has received any correspondence from Germany about the cattle disease he has submitted this article for, that the editor in turn publish whatever important insights into treating a local epidemic striking the cattle about this time–October 1797. We are provided with a little insight into who Elijah Parsons is through one of the family genealogy sites — Ancestry.com. According to this site, the Elijah Parsons (1742-1827), who later became a Reverend in East Haddam Connecticut, was born in 1742 in Northampton, Massachusetts, with Isaac Parsons and Lucina Strong as his parents. He married Mary Chauncey, followed by Elizabeth Rogers, and then Meliscent Spencer. He passed away on 27 Jan 1827 in East Haddam, Connecticut, USA. Parsons, Elijah, — 1747-1827. 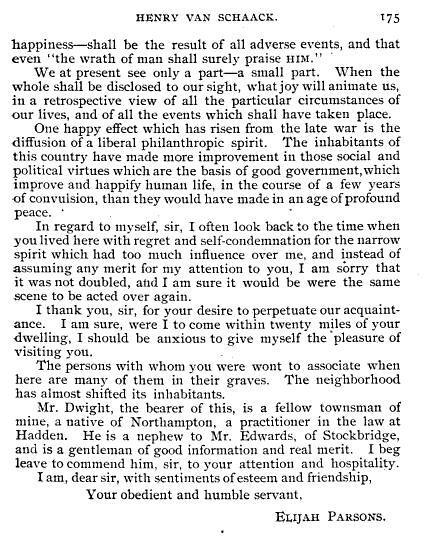 A sermon, preached at East-Haddam, at the ordination of the Rev. Mr. Elijah Parsons : to the work of the ministry, and pastoral care of the First Church and Society in that place; October 28th, A.D. 1772. New-London [Conn.] : Printed by T. Green., 1773. Reverend Parsons had a number of important interactions and possibly personal relationships with several leaders in the medical field. One of these leaders was Reverend Manessah Cutler, the author of one of the first comprehensive materia medica books on local Indian herbal medicines. We learn a little more about his philosophy of disease curiously from a letter he wrote to Henry Van Schaak on June 15, 1790. Van Schaak had written him earlier on January 27th. 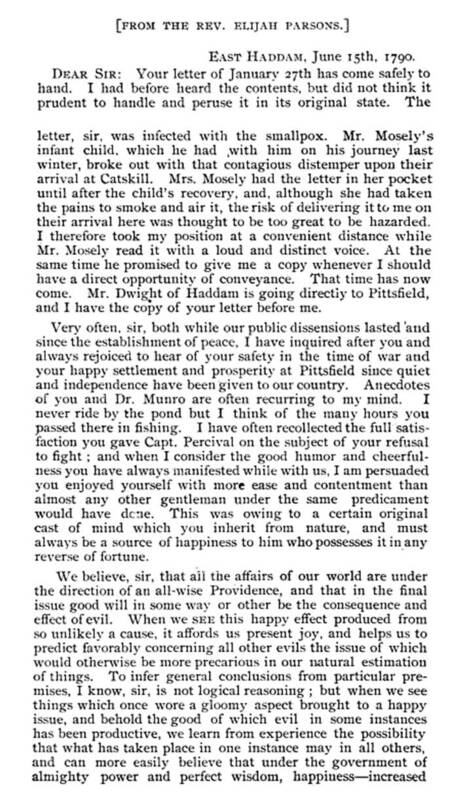 The delivery of that letter was by a Mr. Mosely, whose infant child came down with the small pox during the trip to the Town of Catskill. Parsons was very familiar with the contagious nature of this ‘distemper” and so refused to handle this letter Parsons sent him for quite some time. From Henry Cruger Van Schaak’s Memoirs of the Life of Henry Van Schaak. . . . (Chicago, 1892). An important part of our pastoral interpretation of man and the environment is the interpretation of how well adapted man and animals are to their farm settings. The pastoral philosophy of the late 1700s and early 1800s included the requirement that we modify our environment in order to make the best use of the variety of natural resources provided to us through creation, or evolution, and our ability to adapt to the changing world depending upon which side of the church door and papal’s podium you were seated on Sunday morning. Both man and domesticated animals were essential to the survival of Earth as a whole according to colonial stewardship practices. For this reason we paid close attention to the healthiness of our domesticated animals, the ability or inability of our land to manage our crops and produce our essential natural resources. All of these were sensitive indicators as to how healthy a given region was. Catarrh in cattle meant that catarrh in man could soon follow. Signs of apoplexy, asthma, diarrhea, dysentery, a loss of control of the passions, the development of hydrophobia, an onset of worms, ulcers or signs of the plague brought on by hundreds of ticks attacking the flesh, all of these were considered signs of an unhealthy environment. For the Livingstons of New York and the Hudson Valley, this common rule applied to cattle and horses and was also true for local wildlife and any attempt made to introduce new foreign animals to the local setting. Chancellor Robert Livingston in particular had this idealist view of the mid-Hudson Valley as one of the healthiest places in the world for English, Scots and Irish to live. For this reason his family claimed and settled all of what would later become known as Columbia County, New York, nearly a century before the Revolutionary war commenced. Following the war, the portions of this property inherited by the Chancellor became one of the most productive regions for farmed fodder and food crops, livestock, and several attempts made to domesticate local wildlife animals like elk and deer. The Chancellor’s property was one of the primary sources for the large wood and naval stores needed by our first man-of-wars during the Revolution. By the end of the 18th century it had earliest iron and copper mines and metallurgy factories in this state, and a number of the first medical springs to be promoted outside the Saratoga region. There is this theory for disease that resurfaces in the medical literature every 50 or so years. The Unity theory, often referred to with the term “Unity”, states that there is a single cause for all diseases. This theory postulates that the body is a perfect entity, which due to its exposure to the environment becomes ill and develops a disease. This is a fairly basic, and at times simplistic way of interpreting health, diseases, and the causes for each, but is often employed by doctors whenever they are unable or unwilling to grasp the total causology of disease and sickness. By focusing on the individual causes that could be ascribed to pathogenesis, we add a great deal of complexity to this philosophy. By focusing on the individual, we can lessen this complexity to some extent, but still have the underlying phsyical and metaphysical sciences to contend with as possible causes for disease. In essence, the unity theory for disease tries to remove the individual’s make-up and the environment’s stimuli as direct causes for disease. These causes are assumed to always exist in the world, and that it is how our body reacts to these stimuli that results in disease patterns. This way of looking at disease theories over times also improves our understanding of the ever-changing theories and forms of medicine that exist throughout history. During the colonial period for example, the external causes for disease were primarily climate and miasma related, and fairly simple to understand, whereas the internal causes were numerous and complex, ranging from temperament, physical form, how our body enables od disables humoural flow, how our vital force behaves, or the belief in whether or not we actually have such a force or are essentially Nietschists with only proof of our existence provided by external, extracorporeal stimuli defined the means by how we behanve and how we live, as healthy or not. Intrinsic and extrinsic stimuli and events are used to determine our health according to the Unity theory. As philosophers, scientists and physicians came to better understand the natural sciences, chemistry, astrology, and ecology, new theories erupted to define diseases causes. The splitters in this kind of medical nosology attended to all the various subcomponents of the increasingly complex tree of medical knowledge being formed. Lumpers of this ideology like to ignore all of these intrinsic and extrinsic subsets of knowledge, turning instead to a single all-encompassing theory for becoming ill. During the late 1700s and early 1800s, extrinsic features of nature were assigned more blame for disease than two decades before. Disease was considered a consequence of our reactions to the environment, its external stimuli, meaning that the best way to prevent or treat these medical problems we experiences was to produce a shield against nature’s elements. Adequate fireplace, adequate cooking facilities, adequate insulation from the external cold, maintaining circulating clean and healthy air, remaining warm by the use of wool, all of these became important ways to stay healthy due to this ideology. Atomism and the stimulus theory for health and disease was strongly supported by this philosophical interpretation of the environment and health. Nervous energy, a major feature of the brunonianism theory that prevailed just before and after the formation of the United States, also influenced and led to the development of the various new theories attached to the unity theory during the first years of US medical history. 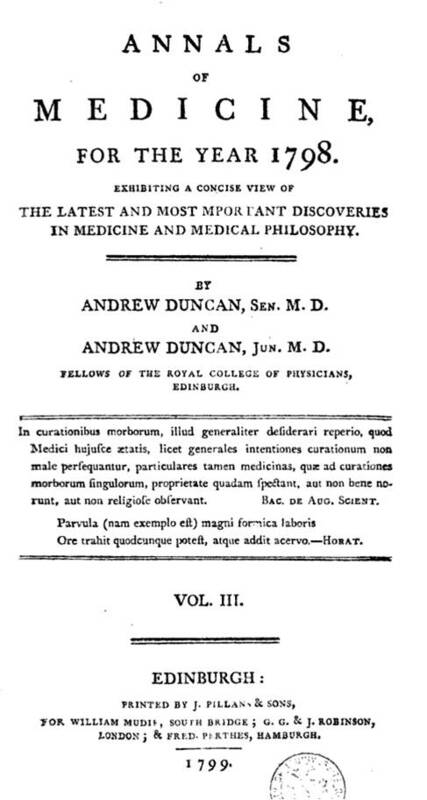 The discovery of electricity by Benjamin Franklin, of Galvanism by Luigi Galvani, or Suspended Animation by various Quaker physicians, were all very important events enabling the newest kind of natural philosophy of medicine to develop by 1800. To those who believed strongly in this theory, excitement caused many diseases, excitement induced by nature, our reaction to these events, our ability to control or react to our lack of control of the passions that resulted were all additional causes for diseases that existed in this new ideology. In essence, this meant that our ever-engaged manner of reacting to our social and natural environment was the basic cause for disease. This also meant that all of medicine had to be devoted to avoiding whatever unhealthy reactions might ensue from happening. This same philosophy for human disease was applied to animal born diseases during the first decades of United States medical history as well. Whereas scientists referred to this concept of studying nature and disease as a study of natural philosophy, religious leaders often viewed it as a consequence of their strong religious faith, in which underlie some of the most important conclusions they draw–God is the cause for illness and disease. Everything about the natural philosophy of a given area that livestock frequented had a relationship with their health and ability to survive. They had the same diseases as people, and some were more adapted to certain living settings than people. Likewise there were places where people were more adapted than certain animals to a given setting. The choice of “stock” for your household or farm was very much dependent on these relationships. To differentiate animal husbandry from human medicine, some terminology was in place, like epidemics and the animal equivalent epizootics. Endemics had their matching enzootics. Sometimes the consumption of man had its equivalents in horses and cattle. Any diseases that cause catarrh in cattle were considered pathogenic to people. The similarities between kine pox and small pox, as evidence by our improved understanding of the immunization process, provided still more support for this philosophy. In the Bible there was the murrain, the fifth of seven epidemics that came down upon Egypt and its people. During the period of Moses, there was a kind of murrain that existed as told in the Old Testament. This form of the epidemic remained active into the Renaissance era, when other forms of murrain began to appear in Western Europe. This second batch of Murrain diseases struck the English farms in 1797. Apparently this is the reason Rev. Elijah Parsons his article to the Medical Repository for publication. His reference to German writings and physicians in assocaition with the new disease striking the cattle in his homelands in Connecticut infers his fears, as a Deacon, that murrain was now beginning to strike the United States. In 1797, the following murrain and related writings were noted in a German Annual which routinely included a list of the newest books to be added to the local libraries that year. The top 2 essays in this list relate to the new murrain striking western Europe. Europe was just a couple of decades of the United States when it came to land use changes and the development of new diseases. Well learned individuals were probably well aware of the temporal patterns related to colonization, settlement, economic development and urbanization of highly successful economics settings like the well placed port cities. These observations led people like Benjamin Rush to write about the recurring patterns of change with time that are seen whenever lands are settled. The precursor to the more contemporary sequent occupancy theory he published in 1786, as a result of a presentation he gave on this topic to one of the Royal Academies of physicians in England. 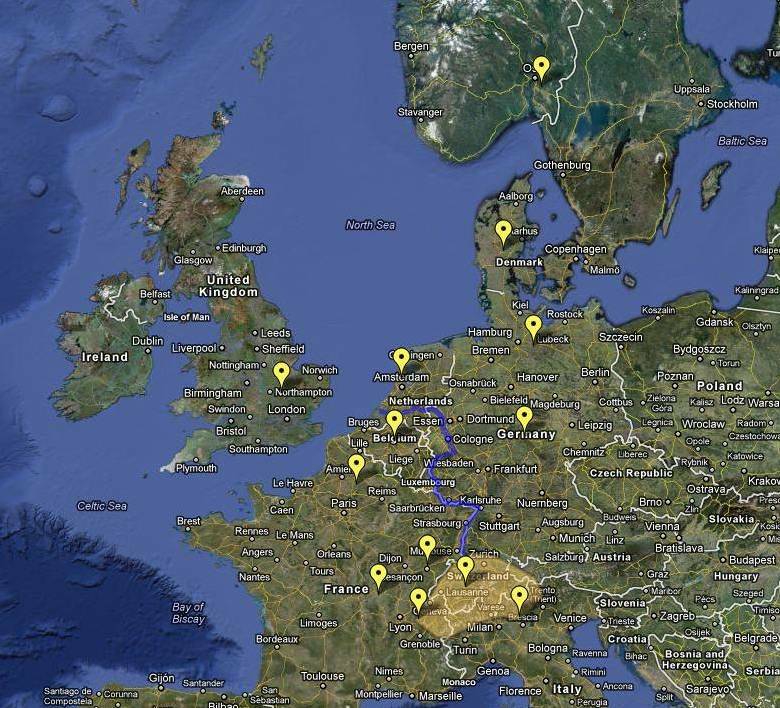 A related observation of the same was made by Dr. Johann David Schoepf during his travels to America in 1783 and 1784. 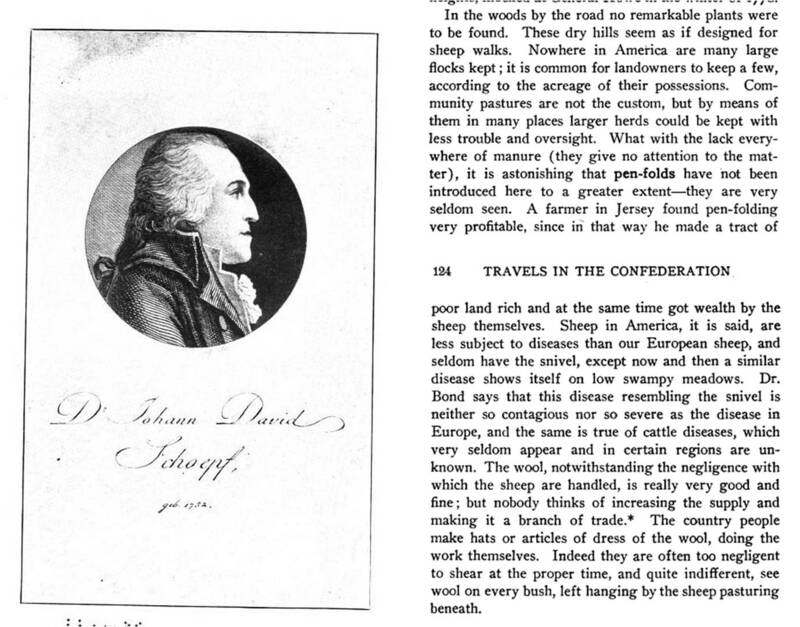 I have already made mention of Schoepf due to his importance in documenting the early work of American botanists and the local use of plants as medicines. 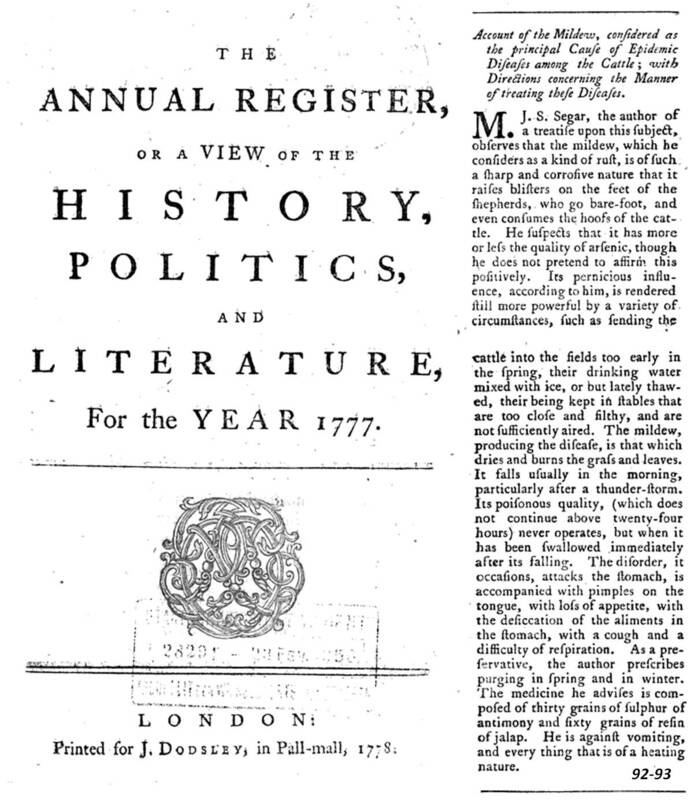 This item was published in 1787, a few years after the publication of his notes about his travels. In his notes, he makes mention of the economic grade at which the cattle farms existed in the new country. The seuent occupancy philosophy fits in very well with this observation he makes–suggesting that this period in American history was past the pioneer stage of development, and entering into an early domestic farmlands stage, with small, very local industries being established. This level of local development also suggests that the United States was about to enter a period when new diseases would form due to the new relationships being established between man and himself, man and the environment, man and animals, domestic or wild. One of the first medical journals in this country is Medical Repository, which began its publication during the mid-1790s. From its first year of publication, this journal included many articles about farming and livestock industries, and since it was printed in New York City, editored by the State’s future main congressman Samuel Mitchell, many of these articles focused on the health of the rural parts of New York. Mitchell’s Medical Repository published regularly the Minutes of the local Agricultural Society meetings and details on the topics presented at these meetings by the members. A number of these topics were reviewed separately as well as a part of the quarterly journal. Local printers published the results of the local agricultural society meetings and events. 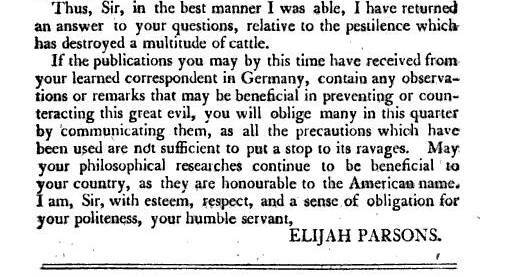 The following is Reverend Elijah Parson’s remarks on the cattle epidemic that took place near East Haddan, Connecticut in 1797. He poses a physical theory for its cause–poison, possibly a poisonous plant. The fact that it struck numerous cattle so quickly and in a deadly fashion does remind us of the water hemlock and poisonous hemlocks found in natural, unprepared hay fields. Fatal to yearlings in May and June, calves in autumn, and a few older cattle in Winter, this epidemic does appear to have some links to one of the two hemlocks as a possible cause. However, a more focused review of the text suggest this is an early introduction of a zoonotic disease that 46 years later would create havoc in the dairy industry so important to New England and New York State. Forty-six years later, in 1843, it made its official entry into North America due to the growth of the cattle industry. Its routes of entry were the sizeable ports designed for cattle ships in Brooklyn, just across the way from the largest dairy consuming population for the time–New York City (this might even relate to the Sylvester Graham movement). Since this page serves as an introduction to this section on the local history of animal diseases, a few possible diagnoses for the condition described by Parsons are covered. Anthrax is the most common zoonotic disease documented in medical journals during this period in American history. A disease of horned cattle, the tendency for this disease to be associated with horn-bearing farm animals led Parsons to make note of this breed of farm animals in general, and perhaps even is one of the possibilities Parsons reckoned with in trying to identify the cause for this animal disease, but in the end we know Parsons knew almost immediately these cases of were not anthrax, otherwise, he would not have continued on with a discussion about poisonous plants. Suffice it to say, Parsons needed a possible explanation for the disease striking the young cattle, and came up with this possibility due to the assistance of the growingly popular chemical aspect of medicines during this period in American medical history. Poisons were not only toxic and fatal, but also life-saving and at times life-rejuvenating. Digitalis was the proof for this, at least in those who were well read in the British Medical profession’s findings. Parsons needed another explanation for this disease and so ends with that open-ended question that needs to be answered. Most importantly, he mentions a “learned correspondent in Germany”, residing right at the north edge of the region infested by a similar disease over the past several decades. This ultimately would be the cause for the livestock epidemic. To Parsons, the exact identification of this disease remains uncertain. The fact that cattle and other young animals are impacted more might suggest some diseases more common, and more fatal to young animals. To historians, the “swollen spot” could be a give away for this diagnosis. It fits the descriptions given for abscesses related to cases of Bovine tuberculosis, a topic covered in more detail on other pages at this site. More than likely this is a description of one of the first bovine tuberculosis epidemics to come to the United States following its establishment in 1787. It took ten years for government stability to set in, followed by economic stability and ultimately commercial stability and success, and so came the infected animals from western Europe to the U.S., perhaps for the first time in decades, and for some diseases, the first time ever in United States history. Ergot. Ergot is a possibility due to the involvement of grain, and the possible involvement of entire fields of crops. Milk Poisoning. Calves and other young depende upon their mother for milk, suggesting that this could be an early example of the milk poisoning later common to medical literature. If this was the case, then it was probably due to a Eupatorium species. Other toxic plants well known to be this fatal include Datura or Veratrum. Datura (Jimsonweed) is introduced from the south, but may have been present as an escapee from gardens in certain fields. Veratrum (False Hellebore) is a very likely species, and its possible cause would be supported by a sudden surge in cases of cyclopic calves.